Apple Teases OS X Lion in “Back to the Mac” Event, But What’ll It Be Like? 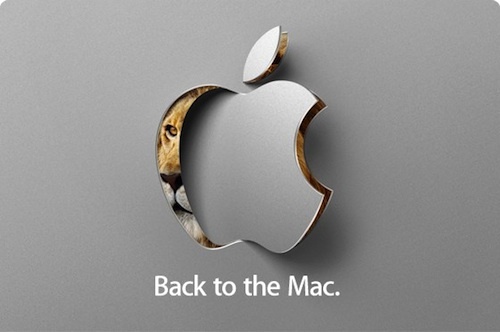 Hiding in the logo for Apple’s new press invite to an October 20th “Back to the Mac” event is a picture of a lion. Woah! That’s one enormous hint it’s all about the next-gen OS X. What’ll it be like? Back in June 2008 Apple revealed it was working on a new version of its flagship operating system OS X, then successive developer releases and test cycles resulted in a public launch of Snow Leopard OSX 10.6, superseding Leopard 10.5 in August 2009. That was just over a year ago. And now Apple’s surprised everyone with that image above. We knew it was about time Apple directed some attention toward its signature Mac computer lineup, after so much fuss over the iPhone and iPad–and Jobs himself even hinted as much in one of his mysterious emails earlier this year. But that tiny sliver of a lion photo in the graphic is still terrifically exciting. It means OS X 10.7 is about to be revealed, along with a roadmap for its development, testing, and ultimate public release. It’s important because it’ll involve Apple’s response to Microsoft’s Windows 7 and Google’s Chrome OS efforts. The question is: What’s OS X 10.7 Lion going to be like? OS X 10.6 was an incremental change to Apple’s Mac operating system–at least from a user point of view. It was lots of spit and polish, tweaks to the UI and refinements to Mac standards. Sure, some big bits of code cleverness were involved, like the multi-core optimization of Grand Central, and the radical overhaul of the code from the ground up so the entire OS was lighter in terms of processor and disk space demands … but users didn’t really see much of this. But the new big cat of 10.7–the Lion–hints that big changes are likely to happen. We may expect a radical UI overhaul, much more advanced multi-core processing options, ditching of legacy code and OS support, and even esoteric tweaks like social networking embedded throughout the entire OS. Apple chose to create iOS for the iPhone and iPad because it thought, correctly as it turns out, that a traditional desktop OS wouldn’t translate well to a smartphone (something Microsoft has only just properly got a grip on). While the majority of OS X’s code base is at the heart of iOS, it’s deeply hidden beneath a touchscreen-friendly layer. There’s a high likelihood Apple will consider this in the new OS X. Why? A barrage of Apple patents are strongly hinting that touchscreen Macs are en-route. And while the current OS X is arguably more touch-friendly than its rivals, it’s not optimal. A new OS could incorporate advanced multitouch gestures, possibly even motion-control input via the webcam, and may possibly involve a switch between “touchy” mode and “normal” mode. Is OS X 10.7 going to be the first cloud-based OS from Apple, starting from a totally revised Back-To-My-Mac system, and leveraging that huge new data warehouse Apple’s building in the U.S.? Nope, not entirely–that’s too radical a departure from the current model, and the end-user Net infrastructure’s not quite there yet (witness AT&T’s 3G data woes). But it’s almost guaranteed to involve much more sophisticated cloud-based services throughout the code. We’re guessing that much cleverer systems than iWork.com will allow for cross-device sharing and syncing of contacts, files, media, apps and so on–far more neatly and reliably than Snow Leopard and iOS with iWork can manage. Is OS X Lion going to be an ad-supported OS, with pop-ups, back-ground and in-app adverts? Nope–that’s also too radical a departure from the current model. Apple does “think differently” but it’s also careful about its products. On the other hand, Apple has patented ideas in this area, and iAd on the iOS products is a sign Apple’s very serious about advertising, so perhaps we may see some limited form of integrated advertising. Maybe via the App Store? Apple already tried a variation of “apps” on the desktop with its widget framework in “dashboard”–a pop-over screen that could quickly give users access to lots of data, like the weather, emails and even games–but this has largely fallen by the wayside and Apple’s not mentioned it in ages. Is it time that Apple tried to refresh the entire PC software market by injecting some of the App Store magic it’s worked in the mobile space? Possibly. It’s a tricky proposition, given long-established practices and development-to-sales chains. But we wouldn’t be surprised to see an App-like framework incorporated into OS 10.7, that possibly even would allow users to run Apps they’ve bought for the iPad on the desktop, for a number of reasons. Firstly this would allow for more sophisticated apps, and better syncing of data between content you’ve worked on when mobile and when on the desktop. There’s also the prospect of getting a bigger audience for in-app adverts. And with hints of wireless syncing and Apple’s numerous NFC patents, it could allow for some seriously clever iPad- or iPhone-to-Mac communication between apps–merely by setting the mobile device on the Mac’s keyboard or lid perhaps. Fanciful–yes, but not impossible. We know there’s increasing tension between Apple and Adobe over Flash and other Adobe products, despite the two companies’ long co-working heritage, and a slight defrosting of Apple’s chilly stance on Flash on iOS recently. Will Steve Jobs use OS X Lion as a lever to fully shut out Adobe, with clever new-tech and barriers to using Adobe code? Probably not. As well as risking the wrath of government competition legislators, it would inconvenience millions of creative types who rely on Adobe code. Let’s just say we don’t expect support for Adobe to be front-and-center of the new OS. What kind of hardware will OS X Lion support, or render useless? Impossible to tell. We can expect multi-core support, and maybe the first hints that OS X will run on ARM chips as well as Intel (with our eyes on those fantastic-sounding up to 8-core ARM units). We can expect integrated support for multitouch screens, super-fast USB, maybe the LightPeak optical interconnection for data, and just possibly Blu-ray (though this is a long shot). NFC may be baked in, along with better voice synthesis and voice recognition. Will Apple embrace 3-D desktop designs? Who knows. How long is a piece of string? Apple’s bound to add in a pile of unpredictable stuff, way beyond the scope of this post–some of which is speculative, and some of which will be way wide of the mark. Maybe you have some ideas? Watch this clip from 2000 of Steve Jobs revealing, for the first time, some of OS X’s impressive new tricks (and laugh at the amazement in the crowd of things we now take for granted) to give you some inspiration, and then tell us your expectations in the comments.